If your website is slow to load, it may be time to take action and make improvements to enhance the speed your website takes to load. Google have announced that they are testing a red slow label in the search results to warn users of websites that are slow to load. The slow label could have an affect on visits to your website, as users may avoid your site due to its slow load speed. The red slow label is currently only visible to some mobile android users and is only applied to Google sites. Google have been expressing the importance of mobile performance of websites in recent years, this latest feature suggests they are taking website performance particularly on mobile devices seriously and are looking for ways to improve user experience. They have specifically developed an online tool for checking if a site is mobile friendly. There is little information available on how the label is applied and when we are likely to see a full roll out of the feature. What we do know is that the label could have an impact on visits to your website and potentially your search engine rankings. The best way to monitor the page load time of your website is to use Google Analytics, It is thought that a page load speed of more than 4.5 seconds could be a trigger for a slow label. If your website contains images this could be a contributing factor to slow load speeds; changing the image format and compressing images could reduce file size by up to 60%. Also make sure your images are optimised for mobile. Browser caching tells the web browser to load previously downloaded resources from local disk rather than over the network. This reduces the load on your server and enhances the user experience for users who have previously visited your website. Removing unnecessary line breaks and extra spaces can make your website load quicker by speeding up parsing, downloading and executing. 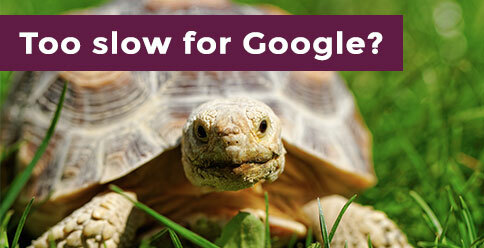 If you are concerned about your websites performance and want to avoid your site being labelled as slow, get in touch. You can call us on 01527 517309 or email us via the contact form.